Whether you have a mature trust funding programme, or are introducing trusts and foundations into your fundraising mix, hiring the right candidate for your trust funding role can seem like a daunting task, especially if trust funding talk isn’t your first language! Often, especially with regional roles, you may struggle to receive the volume of high-calibre applications that you were hoping for, or you may be inundated with lots of fantastic candidates. All it takes is that one great person, but how do you use your interview questions to ensure that you get the most out of the candidate and hire the right person for the job? Interviewing is one of my favourite things to do: I love meeting new, passionate fundraisers and as a self-proclaimed trust funding nerd, I really enjoy dedicating a day to talking all-things trusts and foundations. I have pulled together my top three interview questions for trust fundraisers in the hope that you can come to enjoy interviewing as much as I do! BONUS: If you are a soon to be interviewee, I have handily included some top answers to guide you in your next interview. 1. What would you aim to achieve in this role over the first three months? This is an opportunity for the candidate to really insert themselves into the role and for you to gain perspective into how they would tackle your trust funding programme. 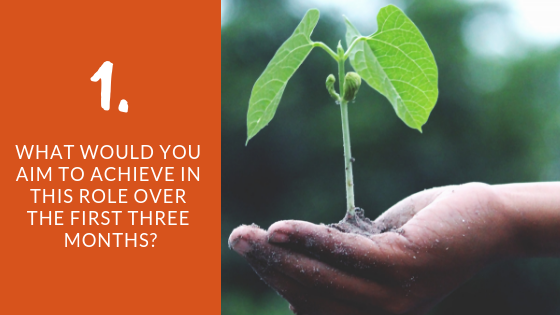 From this question, you want to glean how long it would take the candidate to get to grips with your charity’s work and how they would plan and prioritise their time. “In addition to keeping on top of pressing reporting commitments and planned applications, the first three months will be focused on understanding the detail of the charity’s work. In this time, I would achieve a full understanding of the current funding needs and priorities through cross-departmental work. I would familiarise myself with your current funders, for example, I can see from your accounts that the Garfield Weston Foundation is a main funder for the charity, I would want to know the detail of this, what the reporting commitments are, when the funding period ends and the sustainability plan for after the grant period. 2. 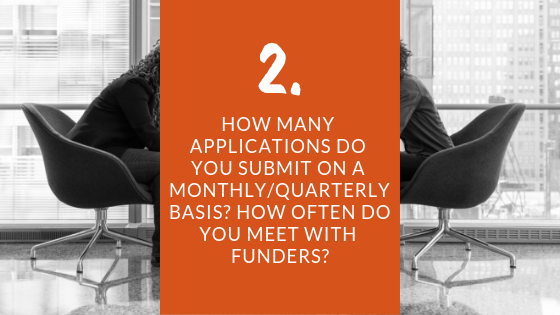 On either a monthly or quarterly basis, can you tell us how many applications you submit and how many face to face meetings you have with funders? 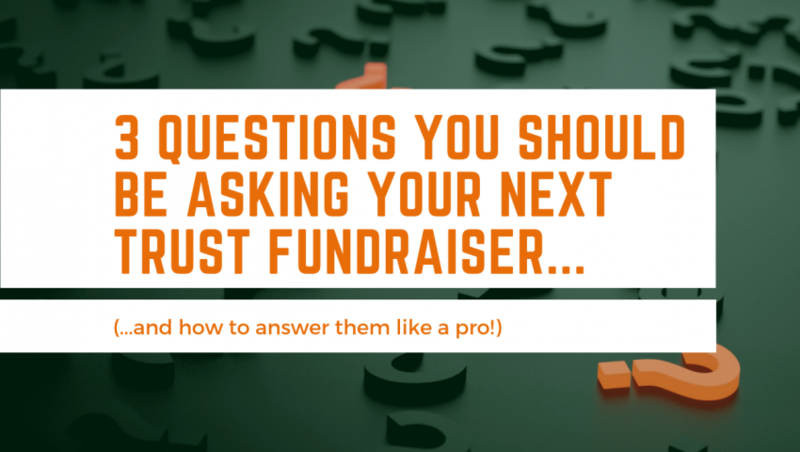 This is not only a question that sets work-load expectations, it also provides insight into the day-to-day aspects of this trust fundraisers approach. You want to be presented with realistic timeframes for applications. If the number is too high, the attention to detail is likely to suffer, if the number is too low, is this trust fundraiser likely to meet the needs and expectations of the role? The face to face element of the question asks your candidate to recognise that trust funding is more than a desk-based role and an opportunity for you to find out how they apply their relationship building skills in a trust funding environment. “The number of applications that I submit are really tailored to the funding needs of the charity. In the last month in my current role, I have submitted fourteen funding applications, however the majority of those were for requests below £15,000. The month before, I actually only submitted two applications however one was a National Lottery Community Fund application, which is a substantial application and takes a significant amount of time to plan and submit well. I love to meet face to face with funders! Relationship building can be underestimated in trust fundraising, but it is so much more than filling in a form. In an ideal world, I would have face to face meetings with funders every month, but it really does depend on the funder. I regularly invite our funders to meet with me at the hospice where I currently work and offer tours, which has proven very popular for our local funders. Throughout the year, I probably do around 12 meetings in this way. Face to face meetings with larger, national funders are less common so I work to build relationships through phone calls and skype. 3. 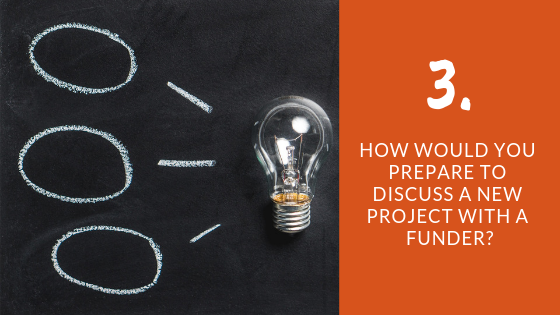 Imagine that you have a meeting with a potential funder to discuss a new project, how would you prepare for this meeting? Chances are, you are looking for a trust fundraiser who can really learn the detail of your work in order to best represent your organisation and write those in-depth, captivating applications. It is really important that a candidate shows willing to work well across departments and spend some time preparing well for their applications and meetings. Yes, you want a fundraiser who can learn things quickly, but beware of the candidate who can profess to learn your cause through a 20-minute reading exercise or a fundraiser that doesn’t acknowledge that building great rapport with operational staff is a key to trust success. “Preparing for a meeting with a potential funder to discuss a new project is a process similar to writing a detailed case for support. I would want to work to understand the need for the project, the objectives, outcomes, impact, monitoring and evaluation, costs and time frames. Ideally in fact, I would have the case for support written. To do this, I would have to work closely with the project delivery team. I would particularly want to discover the detail of how the need for this new project was identified and whether beneficiaries were involved so that I could paint the picture to the funder. I would also research the funder in detail, looking at similar projects and organisations they have funded so that I can explain why our project would be a good fit. I would set expectations of what to expect from the meeting by sending an agenda and outline to the funder in advance. In summary, hiring a new trust fundraiser can seem like a big task but, through ensuring that you have the right questions and expectations, you can give candidates a fair opportunity to demonstrate why they are the right person for the job. Tick here to receive future news, funding opportunities and fundraising tips.